For the next four months Anna is going to be a visiting researcher at the Developmental Psychopathology Lab at King’s College in London. During her visit she is going to work on the consequences of early life stress in human samples, connecting her animal research with human data. The project abroad is supported by the Ruhr-University Research School PLUS. We wish you all the best and good luck, Anna. Take care! This year our labs’ participation at the DGBP meeting in Heidelberg was very broad. With two posters, a workshop and a symposium Nadja, Anna and Dominik were able to connect with other researchers and interested young scientist. We are happy about the huge interest in our work and the fruitful disussions at the meeting. 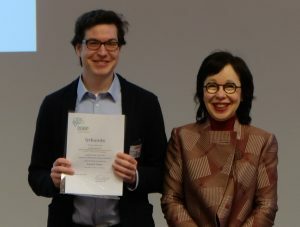 On top of it, Dominik was awarded with a poster prize! Congrats Dominik! Keep going!